The wrapping ribbon is a little ripped in the back. Not affecting the pajamas at all. Pixelated Nintendo Fa La La. 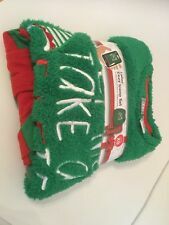 Christmas Wreath Pajamas. Shoulder to shoulder is 15 1/2". RN 17730 Target. Turn inside out Machine Wash Tumble Dry Low. Armpit to Arm pit is 19 1/2". from top of the waist to bottom of leg is 38 1/2". This cozy fleece red two-piece pajama set has a long-sleeve pullover sleep tee and a pair of full-length sleeping pants. The fleece sleep tee is designed to look just like Santa's coat, complete with black buttons, a black belt and white detailing. This pajama set is in excellent shape with no issues seen. It is made of a sheeny polyester. Shoulder to hem - 27". Armpit to armpit - 22". 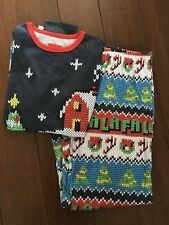 "Christmas Lights" design Pajama/Lounge Set. Soft 100% Polyester. Presented from Target. Length from top of shoulder: 26 3/4. Pullover top has wider cut neckline and long sleeves. Underarm to underarm: 22. Pip to Pit: (Across the chest) 19". Type of Clothing: 2 Piece pajama set. Length: (Top of Collar to hem) 24.5". Sleeves: (Shoulder seam to cuff) 24.5". Details: Light weight, elastic waist, long sleeve. (See Photos). Check out the pictures. Super cute. 2-Piece Pajama. Pull on elastic waist pants. Front collar to hem: 23". Back collar to hem: 24". Waist: 15" (not extended). Machine washable. Pullover top. Material: 100% Polyester.